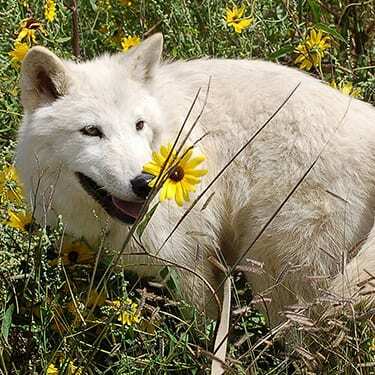 BIO ~ Alice is a spayed female Arctic wolf. She was born on May 3rd of 2006 at a breeder’s home. She arrived at WSWS May 22, 2006. PERSONALITY ~ Alice is a very sweet and playful girl, but she definitely has a wild spirit. She is very cautious around new caretakers, especially women, but she is very loving with staff members she knows well and former caretakers who come to visit her. RELATIONSHIP ~ Alice lives with her brother, Thunder, and her friend, high-content wolf-dog Forest, who she met when she was only a couple months old. The three live in a very spacious habitat on our tour path. Be sure to ask your tour guide to point Alice out! LIKES ~ Alice loves her brother and habitat-mate, Thunder; and stealing buckets and all enrichment treats. DISLIKES ~ Alice does not like small spaces or feeling confined. She absolutely hates when she’s due for vaccines and she has to be contained so the vet can look her over. She doesn’t like when Thunder and Forest leave her alone to go for a walk. FUN FACTS ~ Alice and her brother, Thunder, look so much alike, sometimes it’s hard for us to tell them apart. Alice has a pink dot on the tip of her nose that helps us identify her. We used a beautiful photo of Alice for one of the posters in our Poster Store. WISH LIST ~ We would love to give Alice more aspen bedding so her den can be cozier in the cooler months. Alice would still love more Sponsors! ALICE’S HISTORY ~ The story of Alice and her family (The Arctics) and why they live at Wild Spirit is a long one, but we feel it is important to share it. On May 3rd, 2006, Alice and her siblings were born to captive-bred parents, Yukon and Sierra, at a breeding facility. The story we heard was that Yukon and Sierra were born to wolves who were taken from the wild. The breeder who owned Yukon and Sierra had been selling their pups to select private owners or for exhibits like zoos. Very sadly, in order for wolves to be socialized to humans at all, they must be taken from their parents before they open their eyes. 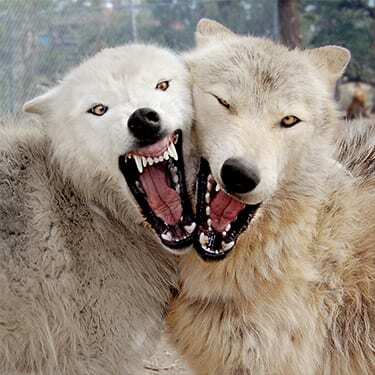 Even then, they may remain too wild-spirited to be comfortable around people and will never behave like a domestic dog. For eight years, Yukon and Sierra had each of their newborn litters taken and sold. The impact of meeting our rescues in person and hearing our message leaves an ever-lasting impression on people of all kinds. We have met many of our largest supporters at outreach events with one of our wolf or high-content wolf-dog rescues. Over the years, Raven literally changed hundreds of people’s lives in a positive way, and people continued to spread our message after meeting him. Most notably, Raven inspired a change of heart in a wolf-hating rancher who bought us dinner and opened his home to us at any time. The trend continued when Forest, another one of our rescues, inspired a hunter to change his philosophy. After meeting Forest and hearing our message, the man decided to cancel his upcoming wolf-hunting trip. These moments proved to us just how important educational outreach is for wolves and wolf-dogs, both captive and wild. Sierra had a litter of six puppies including Alice, Thunder, Sabine, Sugar, Storm and Powder. Unexpectedly, none of the puppies were sold, and the breeder was left with six puppies who needed to be bottle-fed and cleaned every two hours, constantly with people to maintain socialization and continually exposed to many different situations. We had volunteers eager to help, so we agreed to take all six puppies (and eventually went back to rescue Sierra, Yukon, and Axel, too). Even with a full staff and many volunteers, raising wolf puppies is exhausting work. Despite being surrounded by people and hand-raised by humans, only two of the six puppies grew up to be comfortable meeting the public – Storm and our late Sabine. Wild Spirit has grown a great deal since we became an official non-profit back in 1993. We realize we are always evolving, and we work hard to improve and change along the way to ensure we reach our mission statement goals of Rescue, Sanctuary and Education. In order to ensure that our true message is heard and those most in need are offered help, we have decided not to seek out wolf puppies to socialize in the future. If there is a puppy in need of rescue and we can offer them sanctuary, of course, we will. However, we know that the animals most in need are often older, already poorly socialized, and suffering from serious misunderstanding and mistreatment, so those are the ones that we will pursue most diligently. Our Arctic puppies were introduced to a litter of Arctic/timber wolf-dogs in June of 2006. The Arctic/timbers were the same age as our Arctic litter, and although they were supposed to be at WSWS temporarily, their rehoming plans fell through. Since the puppies were all so young, they were raised together as one large pack and naturally divided into pairs or smaller packs of their own choosing as they aged. 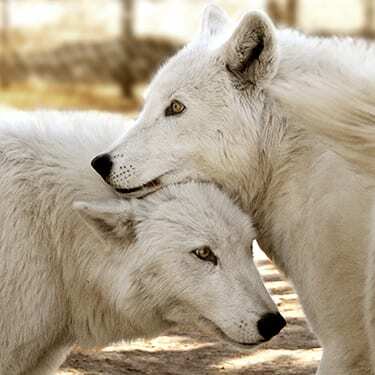 Alice lives with her littermate Thunder and their life-long friend, Forest, and their very distinctly different levels of comfort with people show that despite doing everything possible to socialize a wolf or wolf-dog, sometimes it’s just completely luck of the draw.